Mr. Glenn hates his job. His wife stays at home because of a chronic disease. He starts reading about the hate monger and latches onto it. Over time he loses his job and his relationship after becoming a fanatic. When his wife files a restraining order against him he takes to the streets with his “message” until the Panther finally leaves him for the police dangling like a fish on a hook. When the Hammer of the serpent falls (the one for Ben Grim to be exact) a spark of its power seeks out Mr. Glenn who now calls himself the fear monger and empowers him. He uses his power to build an army to his cause. Foggy Nelson visits T’challa scared that the papers he forged for him will be found out and he’ll lose his legal license once more. T’challa vows he will make no harm come to him. As Chaos erupts in hell’s Kitchen T’challa turns his diner into a makeshift hospital and food source for those left behind. 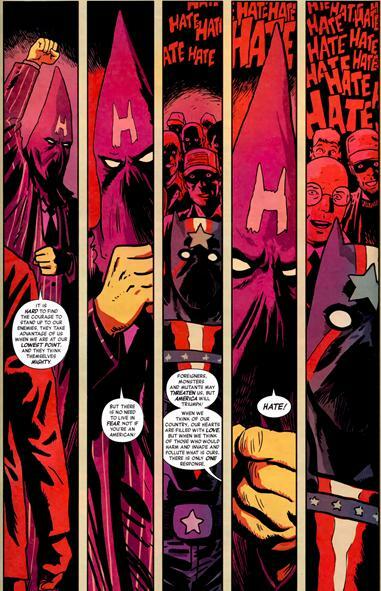 Hatemonger and his men confront them forcing T’challa to back down since any fight would result in the injured being more so. He also meets the American Panther a mysterious figure under Hate Monger’s power. Outside the bar T’challa is handcuffed and taken away by homeland security who have found out his forged papers, inside the car Foggy Nelson laments his days of practicing law are over! Social issues- Mr. Glenn falls into the same hole as most of Germany during the rise to power of Adolf Hitler. Starchily patriotic, seeing all immigrants as the reason why real citizens cant get a job etc. I can see the appeal especially in a recession where jobs are hard to come by and those first born citizens see as second class/immigrants have jobs which they didn’t even want initially! Allot of social issue are brought up! relevant to today’s society and also harkens back to Nazi Germany and the tenets on which Hitler forged that state. It was disturbing to see real news especially about a “foreigner in the white house” being spewed by this man and “take America back” because….lets be honest here people this is happening right now on the news and in the streets. I can’t even mention the dread and terror it fills me with even reading it, not to mention sitting down in a pub and hearing guys at the bar giving you the side eye as they say the same thing. What David Liss has done with Man without fear is craft a tale of social unrest and heroics which hits all the right notes! Cover- The cover which set a million fanboys and even casual bystanders who never even bought a black panther comic book (yeah I’m talking to you!) into a heated rage which set cyberspace on fire! 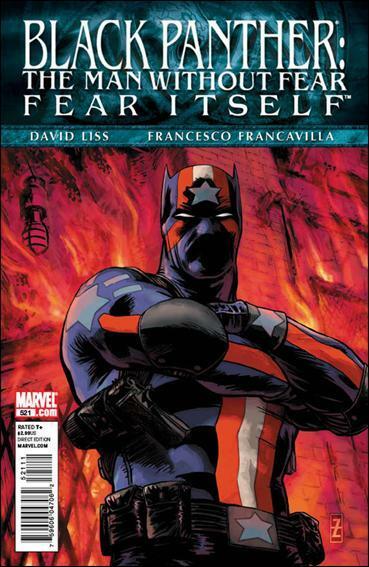 + The issue boats the “Fear itself logo” and a great standalone image of the American Panther (cough ‘Kasper Cole‘ cough) on a burning backdrop which looks plain awesome! 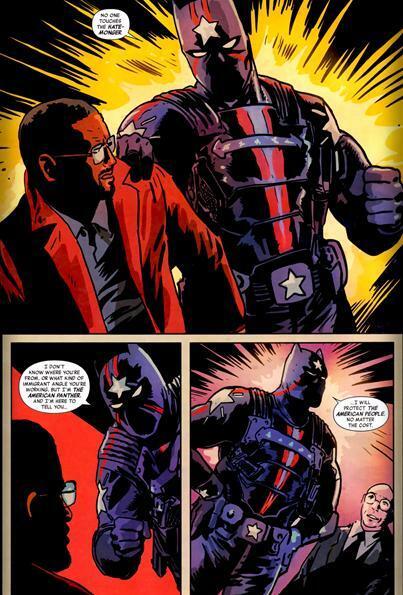 Mystery- Who is the American Panther? That is the question on everybody’s mind right now! Liss has created a mystery harkening back to “Who is the Hobgoblin?” in the spider-man line in the 90’s or even “who is Ronin?” in Brian Michael Bendis New Avengers. Will we be satisfied? that’s up in the air but heading towards the reveal will be quite the interesting ride! Interior art- Honestly if this issue was drawn by anyone other than series regular Francavilla this would have been a perfect issue. This art will also keep some readers away from the book. No action-apart from a thrown punch this issue had no action to speak of.